“Alice in Wonderland” is one of the most popular stories of all time. It is a kid’s novel written by English author Lewis Carroll. The story is considered as one of the best examples of “literary nonsense” genre. It is a story about Alice, a little girl who falls down a rabbit hole into a world populated by anthropomorphic creature. “Alice in Wonderland” characters are extremely popular in the fantasy genre. 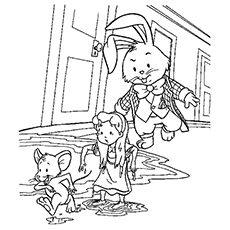 Here are 10 Alice in wonderland coloring pages free featuring most popular characters from this story. Alice is the main protagonist in Lewis Carroll’s “Alice in Wonderland”. She is intelligent and a great thinker for a seven year old child. She spends most of her time with her elder sister, taking daily lessons from her. She is extremely brave and loves to venture into unknown places. Alice is caring, loving, gentle and a wildly curious girl. Here again, you can see, Alice peeping through the gate to the Wonderland. 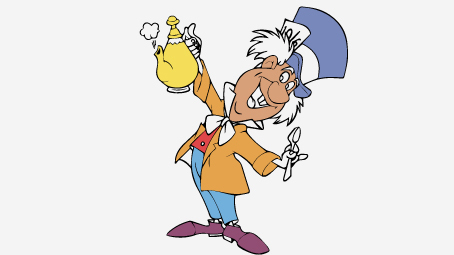 The Hatter, also known as the Mad Hatter is a principle character from this novel. He explains to Alice that he has been trapped in this never-ending tea party. Mad Hatter was sentenced for “murdering time” when he tried singing for the Queen of Hearts at a celebration. The Hatter also appears to be the White King’s messenger. Transform this black and white page into a beautiful page by choosing the right colors. The mouse is the first animal that Alice encounters in the wonderland. The mouse, seeing Alice, gets terribly frightened. He was initially reluctant about telling Alice how he landed in the wonderland. It was only after their discussion about cats and dogs that the Mouse tells Alice his story about Fury and the Mouse that foreshadows the trial of the Knave of Heart. This is the image of the mouse coming out of the pool of her own tears. The White Rabbit is the frantic creature who leads Alice to the Wonderland. Alice, while sitting on a riverbank, notices The White Rabbit. Out of curiosity, Alice crawls into the hole, finding herself falling down underneath a hedge. The White Rabbit is quite kind and timid, but can turn aggressive at times. 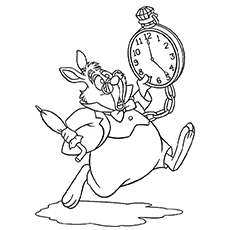 This is an image of the White Rabbit rushing out, wearing a smart waistcoat and holding a pocket watch. 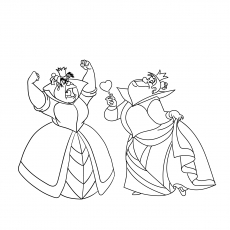 King of Hearts is the timid husband of Queen of Hearts. He is the co-ruler of the Wonderland. The King of Hearts, unlike his wife, is very kind hearted. He secretly pardons most of the subjects that his wife sentences to death. He also saves Alice from the wrath of Queen by reminding her that Alice is only a child. The King of Hearts has a tendency to sleep a lot. 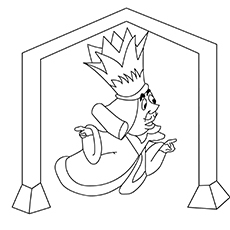 This is a picture of the King of Hearts wearing his signature tall crown. The Queen of Hearts is a wicked monarch, who decrees death even at the slightest offense. All the creatures in the Wonderful fear the Queen. She believes in only one way of settling the difficulties, and that is immediate execution. The subjects in her kingdom are punished before they commit a crime and sometimes even when they commit no crime. The Queen does not even listens to her husband and keeps scolding her at the slightest pretext. The Queen is extremely dominating and screams at her subjects all the time. Here in the picture you can see her screaming at someone. Cheshire cat is a perpetually grinning cat, who appears and disappears at her own will. Alice first encounters the cat in the Duchess kitchen. The cat asks Alice philosophical question, which baffles and even annoys Alice. 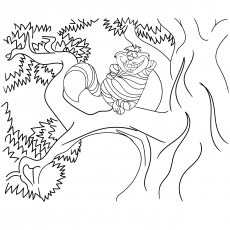 This is an adorable picture of the ever-smiling Cheshire cat sitting on the branch of the tree. The only thing the picture is lacking is some color. 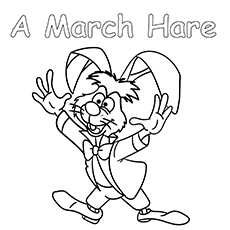 The March Hare, also known as Haigha is one of the most important characters in the “Alice in Wonderland”. He is known for his appearance at the tea party. Just like Hatter, March Hare is also compelled to stay in the Wonderland. He has to behave as though it is teatime because of Hatter, who has supposedly “murdered the time” while singing for the Queen of Hearts. March Hare is shown to live in a house shaped as the head of the hare. He takes extreme pleasure in frustrating Alice. The Caterpillar is a three inches long, hookah-smoking creature of the Wonderland. Alice was initially not very fond of caterpillar. They did not immediately talk, and when he did, it was usually in an extremely rude way. However, he later directs Alice to the magic mushroom that can allow her to shrink and grow. 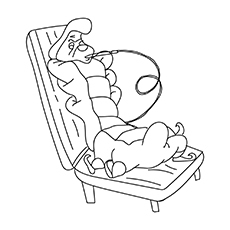 The image shows the Caterpillar sitting on a mushroom and indulging in his favorite pastime- smoking hookah. The Tea Party is the highlight of “Alice in the Wonderland”. 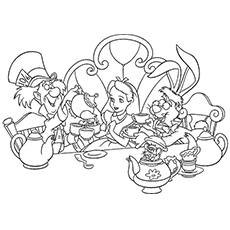 The Tea Party in the Wonderland is characterized by switching places on the table, making personal remarks, asking unanswerable riddles and reciting nonsensical poetries. The tea table is set out under a tree in front of the house, as you can see in the image. March Hare, Hatter and Alice are happily having tea at the table. 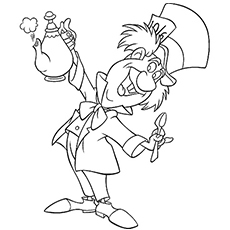 These Alice in wonderland coloring pages printable will surely bring a smile on your kid’s face. 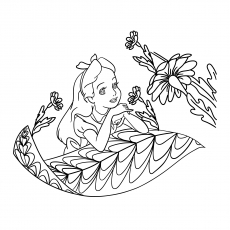 Print out these Alice in wonderland coloring sheets so that your kids can paint them with watercolor or crayons during their holidays.